Email jdoncaster@hotmail.co.uk,or click on 'Home' and use the contact page. DON'T FORGET TO LOOK AT THE 'BLOG'WHICH HAS ALL THE NEW SCULPTURES ON ! Click on 'Home' and the 'Blog' option will drop down.PRICES are under the 'more' section. Sculptures can last upwards of ten years outside ( I have one which is fifteen years old and still looking lovely!). They do need to be oiled at least four times a year with a mix of Linseed oil and turpentine/turpentine substitute which is quickly and easily applied using a household plant sprayer.If your sculpture does need to be repaired then I can do this also. Joolz Doncaster is behind the wonderful, dynamic willow creations that are Wicked Willow. 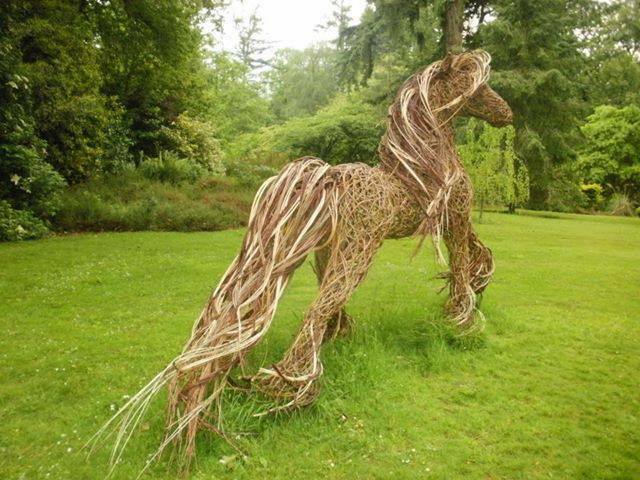 At the yurt workshops in Cove, Joolz can create beautiful, life-size and life-like bespoke willow sculptures for your home garden, business, school or other venue. She can also make living willow structures for you to enjoy and experience, making the perfect addition to your garden space. What about commissioning a willow sculpture as a birthday or anniversary present? Or to celebrate a special event at your school? Wicked Willow has a Facebook page too - please have a look to check out what's happening at the moment! There's a link at the top of this page,click on the 'f' to see new sculptures which are being made.Also current sculptures that are being made appear on the Website Blog,just click on 'Home' and the Blog option will drop down.Click on that and you're away! She can design and create a beautiful willow sculpture for you - get in touch to discuss your ideas and requirements.Delivery can be arranged either by herself or by courier.